GST won’t make your favorite burger cheaper, but it will surely make its payment simpler. GST aka Goods and Services Tax is India’s biggest Indirect Tax reform. It is aimed to provide a simplified way of indirect taxation in India by replacing other taxes like VAT, CST, and Excise etc. Assume that there is a manufacturer of dresses and he sells them to a wholesaler. So under the non-GST regime, Manufacturer buys raw materials at Rs. 100 which includes tax of Rs. 10 then he adds a value of Rs. 30 to ready the dress and now, its gross value is Rs. 130. Assuming a tax rate of 10%, he will pay Rs. 13 as tax and so the dress is sold to the wholesaler at Rs. 143. But under GST regime, the tax of Rs. 13 can be offset against the tax paid on raw materials and the effective tax comes out to Rs. 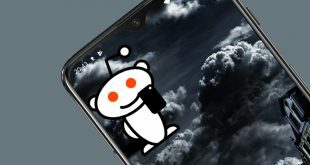 3(Rs. 13-Rs. 10) and the dress is sold to the wholesaler at Rs. 133 (143 in the case of the non-GST regime) as there is no tax on tax under GST. So you use the difference is of Rs. 10 and dress get cheaper. For a better understanding of GST, check out this video by IndianExpressOnline. GST has definitely made taxes simplified but its implementation has left everyone confused. 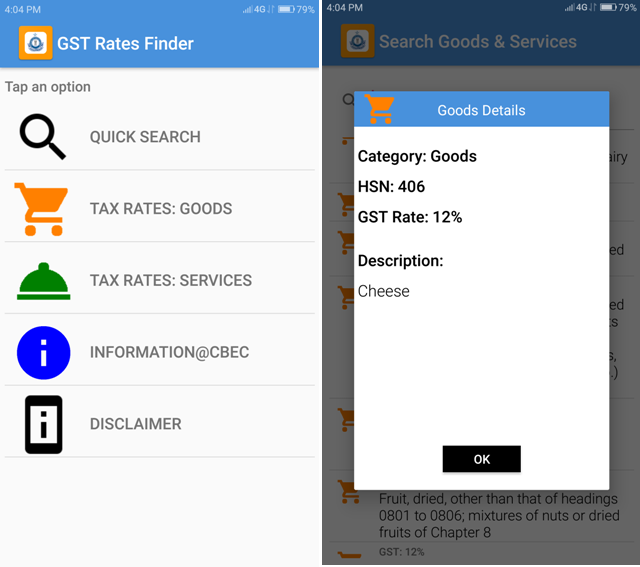 If you’re a customer who wants to know how much GST will be applied to specific products or if you are a manufacturer who wants to know how much GST will be applied to the product you are going to launch in coming months, then this app for you. With GST Rate Finder helps you can search for various goods and services and their respective GST rates and details. You can easily search for the item you want to know about using quick search, it has even categorized goods and services according to applied GST such as 0%, 0.25% etc and clicking on a particular good will give you its HSN (Harmonized System of Nomenclature) number. The best part about this app is that it’s from the Government, so the information will be factually correct. Also, it’s free and contains zero ads. Though you can do your GST registration on GST Online Portal, this app gives you the freedom to do it on the go. This app is an offline service to enroll an existing State VAT/ Central VAT/ Service Taxpayer to the new GST regime. The app enables a user to fill GST registration migration application offline and automatically creates the data upload file. The app makes GST enrollment easy and on to go. It’s free and contains zero ads. So if you in a business where you have to constantly keep yourself updated with everything related to GST (probably a Charted accountant) then this app should be on your phone. 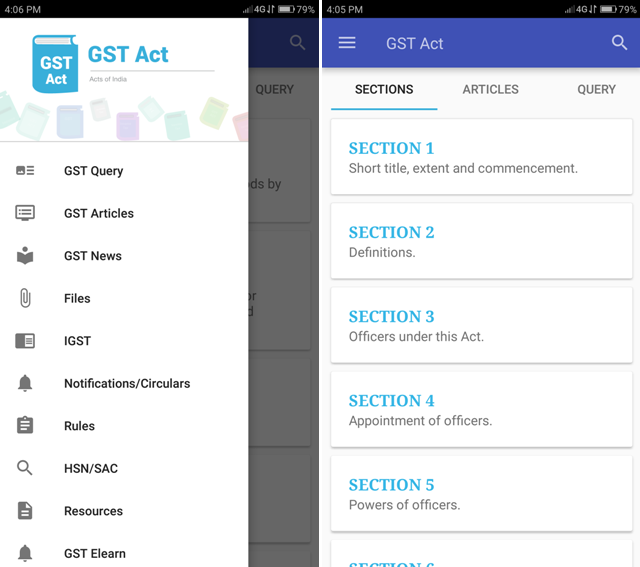 GST Connect has every resource related to GST and will keep you updated with latest changes in the law. It shows Sections of GST Act and IGST Law, articles by experts and CA’s, and you can even ask your query. Other than these it shows GST News, files related to GST, HSN and SAC numbers, and much more. The best part is that it can work in offline mode; it’s free and contains zero ads. 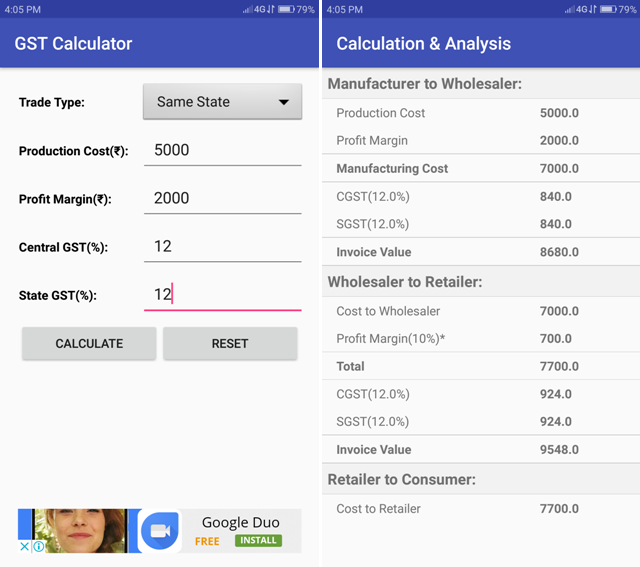 The 1st app in this list tells us about the rates of GST applies to products, but if you are a business owner who wants to calculate how much should you charge aka MRP of your products under GST, then you can do that using this calculator app. Simply select the trade type, put the production cost, profit margin, GST rates applied to your product and you are good to go. It gives you complete calculation and analysis of invoice price. This is useful if you are a manufacturer, wholesaler, retailer, and even a curious customers. 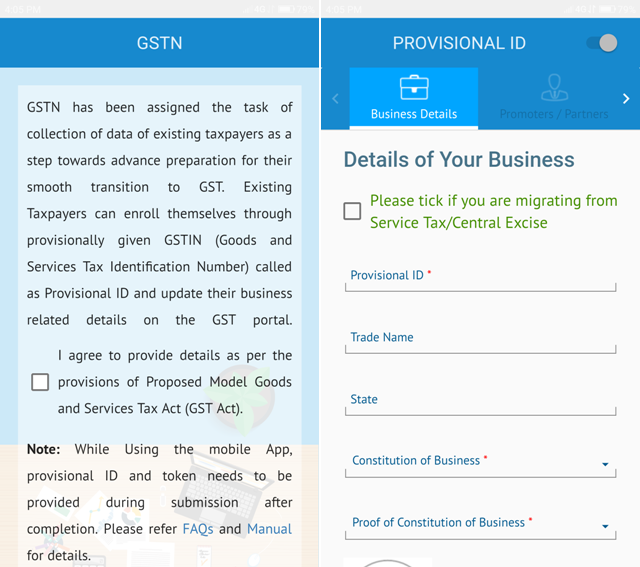 The app also gives useful information about GST, important dates etc. But my fav part is, that it even works in offline mode; and yes, it’s free but contains in-app ads. 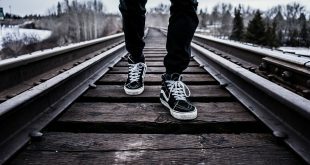 Is GST a good decision or bad? Only time will tell. But it’s definitely India’s Biggest Tax reform. And the best we can do is to get us more updated with it and app like GST Connect will surely help you do that. Tell us how do you think about this decision or if know any other app related to GST in the comments below.